The Dracula Dossier. In my previous article I shared an exclusive preview of the Carfax section. Now it is time for an interview with Kenneth Hite and Gareth Ryder-Hanrahan. As mentioned before I am a fan of the Night’s Black Agents RPG. 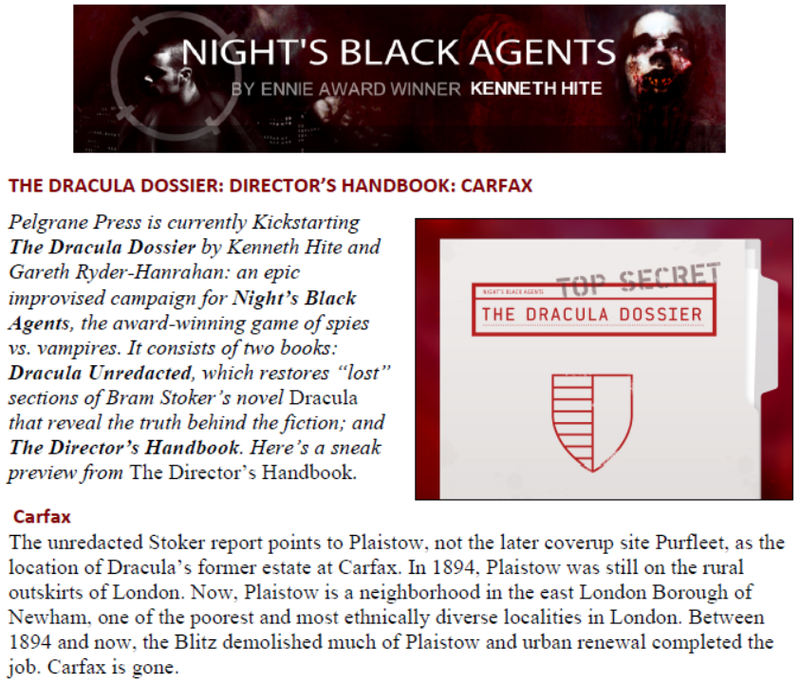 The Dracula Dossier Kickstarter was for me the most anticipated roleplaying project of 2014! I can only bow down before the idea and the creative approach. 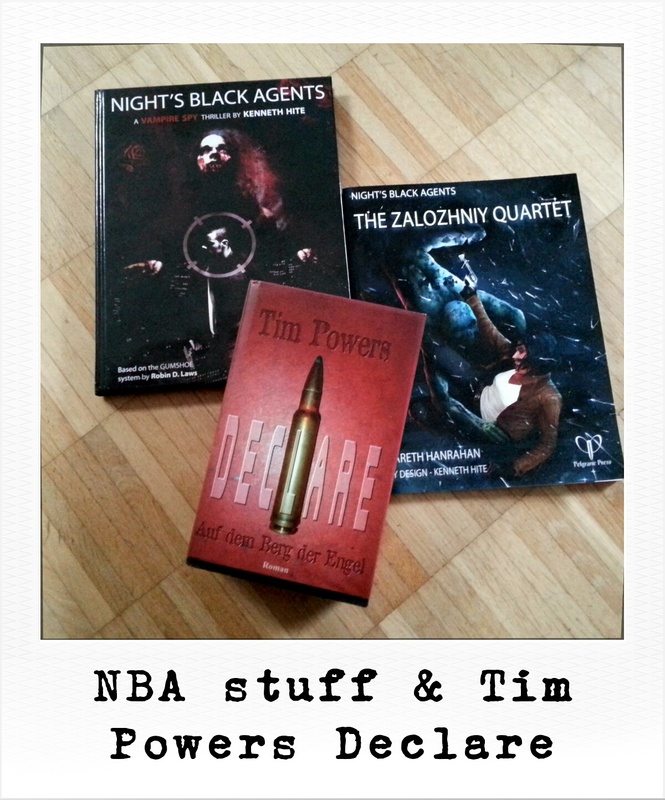 Kurt Wiegel (Game Geeks) said something about Night’s Black Agents I can only agree: „This is an extremely well-crafted, beautifully put together book… Honestly, anything that Ken Hite can shake out of his keyboard I’m interested in reading.“ Personally, I would like to add Gareth Ryder-Hanrahan. If you don’t know Tales from Wilderland for The One Ring RPG go check it out. Good stuff. In terms of getting the right tone or atmosphere I liked it much more than Peter Jackson’s cinematic disfigurements of the Tolkien material. Your mileage may vary. Back on topic – here is the Q&A with Kenneth Hite (Ken) and Gareth Ryder-Hanrahan (Gar) about The Dracula Dossier. We already know that the Dracula Dossier is about an uncensored version of Bram Stoker’s Dracula. The Night’s Black Agents will fight Dracula himself and his minions. As far as I can see the new campaign is influenced by the Armitage Files – an improvised Trail of Cthulhu campaign by Robin D. Laws. Why did you also pick up this approach and what does “improvised campaign” mean? What are the advantages? Ken: It’s very much influenced by The Armitage Files, primarily because Robin’s campaign proved to be very successful and fruitful from a design perspective. He was able to put much more into that book than can be provided in a standard, more linear campaign, which opened up the sort of fractal chaos the Mythos represents pretty nicely. With The Dracula Dossier, there’s a similarly metatextual goal: the espionage world even more than the espionage genre is about oceans of clues that can be connected in any fashion — the famous „wilderness of mirrors“ in Angleton’s phrase. Robin’s basic structure looked like a very promising way to convey that feeling. An „improvised campaign“ simply means one in which the designer hasn’t set forth the rooms in the dungeon or anticipated one (or even two or four) narrative threads or solutions to the problem. It’s still a campaign — all Dracula Dossier campaigns will follow roughly the same arc of discovery, pursuit, and final conflict with Dracula — but the routes the players can take through the labyrinth or across the ocean of clues are all theirs to invent, decide upon, and follow. The advantages: the campaign feels more organic, can respond more fluidly to player interest or disinterest, and can be more easily crafted by the Director to suit her individual group’s strengths. Gar: The big advantages are scope and flexibility – wherever the players go, whatever they do, they’ll be on the trail of the vampire. The downside is that it can be more work for the Director, which is why we’ve crammed the Handbook full of building blocks – prewritten NPCs, organizations, objects, locations – that can quickly be plugged together into another part of the conspiracy. Probably all roleplayers love great handouts, but a complete book as a game aid on the table seems challenging to me. Please tell us more about Dracula Unredacted and the also mentioned Hawkins papers. How important are these handouts to play the campaign? Do you just give the book to your players or do you think the material is more approachable bit by bit. How do you handle this in your playtests? Ken: At the core of Dracula Unredacted is Stoker’s original novel, expanded by us to incorporate more espionage-related material and more opportunities for leads to Dracula. The annotations provide even clearer leads and hooks for further exploration. So it might be a complete book, but it’s a book that someone at the table is almost certain to have read virtually all of. Even if a player hasn’t read the novel, they’ve almost certainly seen the films or absorbed the lore merely by cultural osmosis, so they already know key points to hit for further investigation. The Hawkins Papers are entirely supplemental, replicas of documents and images used in the original 1894 operation. They will reinforce some of the leads in Dracula Unredacted, and generally add to the lived and felt experience of play, but they aren’t going to be crucial for play in any sense. Every game group is going to be different. Some groups, like my home group, know Dracula well enough to dive in swinging; others will want to dance around the edges, fixate on two or ten leads that look promising, and fill in the details later. 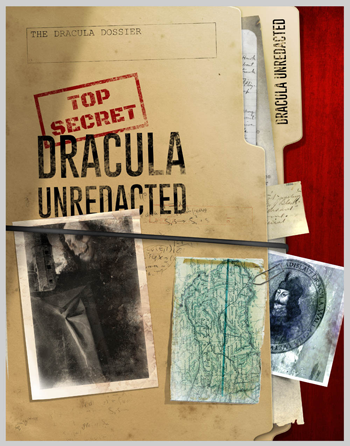 The Dracula Dossier will, I think, be more rewarding the more you know about Dracula, but there’s lots and lots of opportunities and resources for great gaming even if you use the Director’s Handbook without using Dracula at all. Gar: Dracula Unredacted is Stoker’s original manuscript, the after-action report of an 1894 attempt by British Intelligence to recruit a vampire. We’re putting back in the sections that he was forced to take out so he could publish it as a novel, as disinformation. The original manuscript was annotated by three different MI6 analysts – one in 1940, one in 1977, and one in 2011 – in response to three further attempts to use Dracula (as a weapon against a Nazi takeover of Romania, in a mole hunt for a mind-controlled spy, and as a deniable asset against Al-Qaeda in 2011). The players get Dracula Unredacted as a handout at the start of the campaign. Yes, it’s a 300-page handout, but it’s a 300-page handout they’ve already read. Every game group is going to have someone who’s read Dracula, or at least seen the movies. They don’t need to read the whole thing to get started – they can just go „hey, what does it say about Van Helsing“ or „let’s go to Seward’s Asylum and see what’s there now“. You can start off with the players getting fragments of information doled out by an NPC who has the Dracula Dossier – that’s what I did in the early stages of my playtest game, when I didn’t have a version of Unredacted I could use – but the intention is that the players get the book from the start, and use it as a map to explore the shadowy world of spies and vampires. The Hawkins Papers are more documents and files related to Operation Edom, the British „hey let’s recruit a vampire“ guys. The Hawkins Papers aren’t necessary to run the campaign – they’re just background information and cool handouts. In my opinion one strong point of Night’s Black Agents (as we played it) is the “fictionalized reality” approach of the game. The intro adventure (S)entries in the rulebook is set in former Yugoslavia after their civil war. On the other hand at least some Germans do not want to play games that contain any kind of “fantasy” Fascists or Nazis (antagonists) – like in Delta Green, Achtung! Cthulhu or World War Cthulhu. I don’t want to spoil the Dracula Dossier, but there is an option for a Nazi vampire conspiracy. Probably such elements are a selling point for gamers from other countries. What does “fictionalized reality” mean to you(r games) and what fascinates you (as a foreigner) about Nazis in games? Ken: Not that it’s got a lot to do with the Dracula Dossier, but the Nazis fascinate me as a historian, because they started a hugely important global war that my country (among others) wound up pretty heavily involved in. They fascinate me as a student of the weird and the occult because they slathered themselves in it from Himmler on down, and because their occult myth keeps growing branches even after their destruction. They fascinate me as a horrorist for obvious reasons. They fascinate me as a game designer because I like to set games on Earth, and Earth has a relative paucity of bad guys that 99% of everyone agrees need to be stopped — they made themselves into the orcs of the 20th century, and I write in the broad genre of orc-killing games. They’re still turning up as bad guys in spy thrillers right now, in stories set 70 years after they got curbstomped — it’s not just me, it’s the whole adventure-fiction universe that wants to keep killing them. But that said, the German vampire program we offer as one optional factor in the Dracula Dossier can easily predate the Nazis — as it happens, our kind of „default assumption“ is that the Kaiser’s Abwehrabteilung set the vampire program up using Van Helsing’s data, and it flowered during the Weimar era alongside the making of Nosferatu. So it’s not just about Nazis. Second of all, the campaign is pretty inescapably about Romania, and Romania was a very important element of the Axis strategy in World War II — and the Nazis played a fairly prominent role in Romania in 1940/1941 during the Iron Guard’s attempted coup, which we use as one of the core events in the Operation Edom backstory. So we didn’t drag the Nazis into the book — they sort of invaded it. But of course, if you don’t want them in your campaign, you can easily leave them back there in 1941 Bucharest and never meet a single one of them in 2014/2015 — another advantage of an improvised campaign over a pre-planned one. Or, as we note, you can have the Soviets or the Americans hijack the German vampire program in 1945, and the heroes wind up going after an Orlok who’s working for the Russian GRU or the CIA or the modern BND — or Dracula! — or operating on his own. More broadly, fictionalized reality is, as Lovecraft among others have noted, the best possible way to sell a horror story — nestle your fictional, supernatural, or weird element as deeply in fact as you can. It’s also a core element of espionage fiction and ideally of thrillers in general. Part of the reason they all obsess over the sort of travelogue details of their settings or the mechanics of their guns is to misdirect the reader’s (or viewer’s) attention toward the real so they can sneak in the conspiracy or the romance or the fictional element generally. That said, one of the useful things about an improvised campaign is that no one group is completely indispensable, other than Dracula himself. If you want, you can assume the Nazi element ended in ’45, or never get caught up in the Ukranian war, or drop our focus on Al-Qaeda and send Dracula after other foes of the British establishment. The vampire myth is nowadays full of clichés. Everybody “knows” that the sun, garlic, holy symbols, etc. are the typical weaknesses of the bloodsuckers. If I recall correctly, there is a delivery scene at a graveyard in one adventure. This was too much for our group. We didn’t go there – we send a messenger. As expected we heard from him in the newspapers – victim of a violent crime. The game master completely changed this scene for another group. Do you think it is helpful, that the agents intentionally do “silly” things to embrace the idea of horror stories? What is your preferred play style? Ken: I should perhaps point out that in Dracula, the sun isn’t one of the vampire’s weaknesses at all. Dracula walks around in the sunlight all the time, although he can’t shapeshift by day. So the clichés, as you call them, aren’t as solid as that — and we ring a few more possible changes on them in The Dracula Dossier to mesh with the general uncertain-data theme, even though the core of Van Helsing’s lecture remains … let’s call it mostly reliable. I think you’re talking about Gareth’s excellent Treason in the Blood adventure in The Zalozhniy Quartett, or possibly my (S)entries adventure in the core book. Both have cemetery meets. In the real world, spies have meetings in likely death traps all the time — including in cemeteries. Your group isn’t silly to have a meet in a graveyard, it’s realistic — it’s turtling up and sending messengers that’s silly. (Especially in a world where your messenger might be turned with a hypnotic stare or a bite on the neck.) And as it sounds like they found out, it’s also a lousy way to get any useful intel. Night’s Black Agents assumes that players will be proactive, that they’ll move into danger to get information. That’s the core tension of the thriller, as I say in that book — and Night’s Black Agents characters are tough and skilled so they can survive the danger. That’s how I wrote the game, and that’s how I run it. Other GMs run things differently, of course, just like in all RPGs. But bottom line, it’s a horror-action game — if your players pusillanimously avoid both the horror and the action, maybe they should play Night’s Black Agents tuned as a straight-up spy game in lo-fi Le Carré-style Dust mode, which is pretty easy to do, too. Gar: Assumptions get you killed. Night’s Black Agents has all sorts of alternate takes on the vampire myth, some of which have very different powers and weaknesses. We offer two distinct takes on Dracula in the Dossier, and the players won’t know which one they’re facing at the start. As for the players ‚turtling‘ and playing cautiously – there’s taking precautions, and there’s running away from the fun. No-one expects a super-competent spy to go into the haunted basement without a torch or do anything silly like that. If you suspect an ambush in a graveyard, then sending a messenger is fine – but surely you trail the messenger there, and keep them under surveillance, ideally through a sniper scope. Your player characters are the only ones with the skills and contacts to tackle the conspiracy – if you don’t brave the dangers, if you don’t take risks, the bad guys will win. 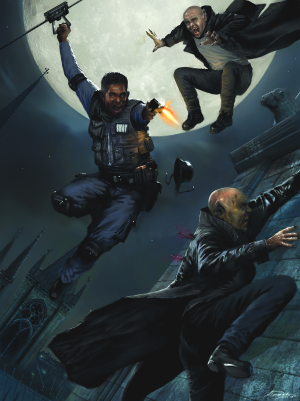 After the Kickstarter and the Dracula Dossier, what kind of further development can we expect for Night’s Black Agents? Ken: I’m not entirely sure I can see past the Dracula Dossier yet — we still have stretch goals to write and reward tiers to fulfill for a while. I think the next big thing for Night’s Black Agents might be a more straightforward campaign with a straightforward full Conspyramid to climb — John Adamus and I co-wrote a pretty great medical conspiracy vampire thriller campaign that we ran tournament-style at Dexcon in 2012. Or possibly a sourcebook covering Asia in the same way the Night’s Black Agents corebook covers Europe — the regional powers, their intelligence agencies, major organized crime groups, prominent terrorists and such, loadouts and special forces in the region, some vampire builds specific to Asia like the vetala and the jiangshi and the gaki, and one or two Asian cities — likely Seoul and maybe Bangkok or Shanghai — with the detailed treatment I gave Marseille in the corebook and Mumbai in Ken Writes About Stuff last year. Gar: This is going to be a big book – the Director’s Handbook is already nearly 300 pages in manuscript, and we’ve got a pile of added encounters and adventures to write. It’s hard to look beyond it, and we don’t have anything immediately in the pipeline. I wouldn’t mind playing with the alien vampire stuff in the future, maybe do a sort of X-Files-meets-X-Com-meets-Invasion-of-the-Body-Snatchers alien hunting game. Finally, at least one fun question after some heavy stuff: Three things every Night’s Black Agent should have for the fight against Dracula? Ken: The same things Van Helsing had — a cross, a stake, and badass friends you can count on. Or failing that, a combat shotgun loaded with sharpened teakwood baton rounds. That would be pretty great, too. Gar: A plan, lots of preparation, and – based on how my players tend to tackle vampire problems – as much high explosive as they can lay their hands on. Thank you for your time, anything else you want to add? Ken: Just thanks to you for hosting us, and huge thanks to everyone who’s backed The Dracula Dossier — or is going to back it right after reading this! Gar: Thanks for the questions, and I’d encourage everyone to check out the Kickstarter. You can get a look at the in-progress documents with even a small pledge, so you can take a peek at what we’ve written so far and decide if it’s something you’d enjoy playing. Do you want to know, why I like Night’s Black Agents and other stuff by Kenneth Hite? His works are thought-provoking. For more about the Dracula Dossier, read my previous post about the Carfax (4 pages, PDF) section. Still here? Get some „sharpened teakwood baton rounds“ and „kill Dracula for good“. 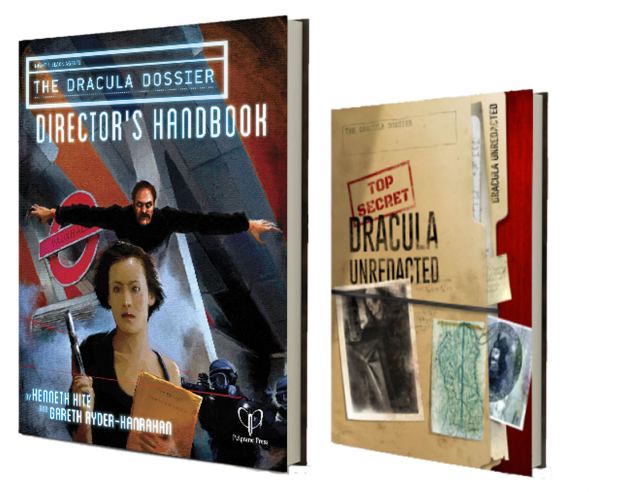 Only a few weeks until Christmas –The Dracula Dossier Kickstarter is live until Dec. 4 2014. Pelgrane Press team and Wade Rockett, thank you for making this interview possible. It is dedicated to my friends @derO23, Chris N., @Cthuloid and the members of „Wiesbaden crew“. We do not play enough. Next time we go to the graveyard. The bad guys will win – one way or another. PS: Finally, some shameless self-advertisment: A Q&A with Robert Schwalb about his upcoming Shadow of the Demon Lord RPG is coming soon!